Since 1995, we have been functioning as Laboratory Funnels Manufacturer, Exporter and Supplier from Pondicherry, India. Featuring wide, conical mouth and narrow stem, our Laboratory Funnels are specially designed pipes for dispensing fine-grained substances or liquids into containers. They have small opening and thus prevent spillage. 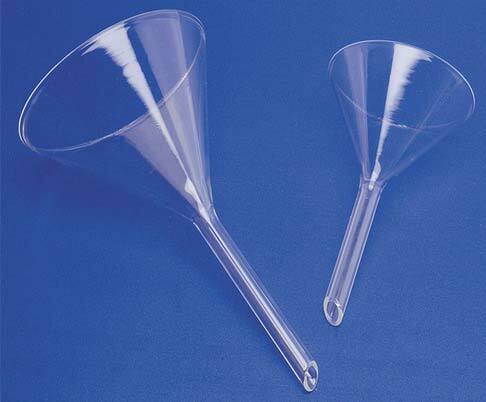 We can make available Laboratory Funnels in different sizes and specifications for buyers all over the country and overseas. Funnels are usually made of stainless steel, aluminium, glass, or plastic. The material used in its construction should be sturdy enough to withstand the weight of the substance being transferred, and it should not react with the substance. For this reason, stainless steel or glass are useful in transferring diesel, while plastic funnels are useful in the kitchen. Sometimes disposable paper funnels are used in cases where it would be difficult to adequately clean the funnel afterward (for example, in adding motor oil to a car). Dropper funnels, also called dropping funnels or tap funnels, have a tap to allow the controlled release of a liquid. There are many different kinds of funnels that have been adapted for specialized applications in the laboratory. Filter funnels, thistle funnels (shaped like thistle flowers), and dropping funnels have stopcocks which allow the fluids to be added to a flask slowly. For solids, a powder funnel with a wide and short stem is more appropriate as it does not clog easily. When used with filter paper, filter funnels, Büchner and Hirsch funnels can be used to remove fine particles from a liquid in a process called filtration. For more demanding applications, the filter paper in the latter two may be replaced with a sintered glass frit. Separatory funnels are used in liquid-liquid extractions. The Tullgren funnel is used to collect arthropods from plant litter or similar material. Glass is the material of choice for laboratory applications due to its inertness compared with metals or plastics. However, plastic funnels made of nonreactive polyethylene are used for transferring aqueous solutions. Plastic is most often used for powder funnels that do not come into contact with solvent in normal use.